The One-Line: Things backfire when several students decide to prank their sadistic teacher but learn that she's actually a witch! Set: Simple. School classroom and a sofa for a living room. Synopsis: After being humiliated again by the sadistic teacher, Miss Hazel, the students decide it's time for a little payback in the form of a fake Halloween party to take place at their teacher's home. The plan works perfectly until they find out that Miss Hazel is not who, or what, they thought she was. With opportunities for audience participation, you'll have a chance to get spooked and laugh your pointy hats off at...The Halloween Party. Notes: The cast is highly flexible. Some characters can be played by audience members which is completely optional. 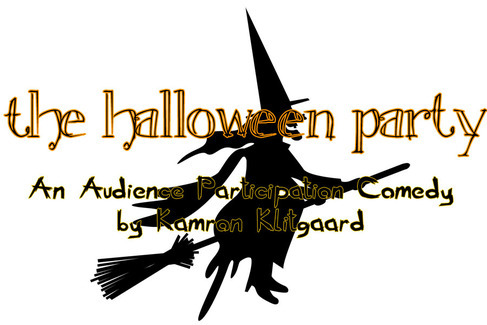 If the audience participation is not desired, then actors can play these parts. If being produced by a school, the names of the characters could be changed to the real names of teachers, administrators, janitors, and students at the school. Doubling also possible.